Nights & Weekends Artists Announced! As I'm getting this post ready I'm listening to the Erasure station on Pandora and I'll be working til the wee hours of the morning with Jenny on a ridiculous list of things. I was thinking today about those of us that stay up all night, work hard on the weekends and continue to push through the day-to-day with things that inspire us, revive us and sometimes intimidate us. I know you guys know what we mean because you came out to show us what you do when you have a free moment. And it was beautiful! Thanks again for showing us what you do! The whole month of September is dedicated to exactly that : working hard and working on personal projects. 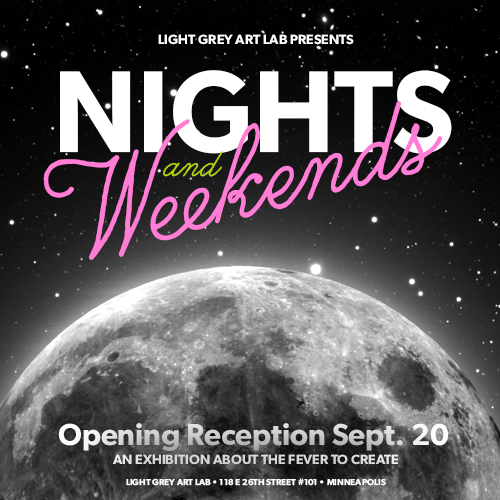 We are going to be celebrating tons of amazing projects by amazing people, including our final list of artists for Nights & Weekends! Featured Artist, Campbell Whyte is coming all the way from Australia to hang out with us and show his epic collection of hundreds of pieces of work! A workshop, an artist talk and some more fancy surprises are in the works, so keep a sharp eye out! We'll make sure to let you know more as we get closer! This show features a small, select group of individuals whose artwork inspired us. During the course of the show we'll be delving into the day-to-day creative considerations of each artist and getting to know what drives them to make the things they make. We're looking forward to a series of interviews, podcasts and process blogs, among other practice-related content! Thanks again to everyone that submitted for the exhibition! We are looking forward to September!